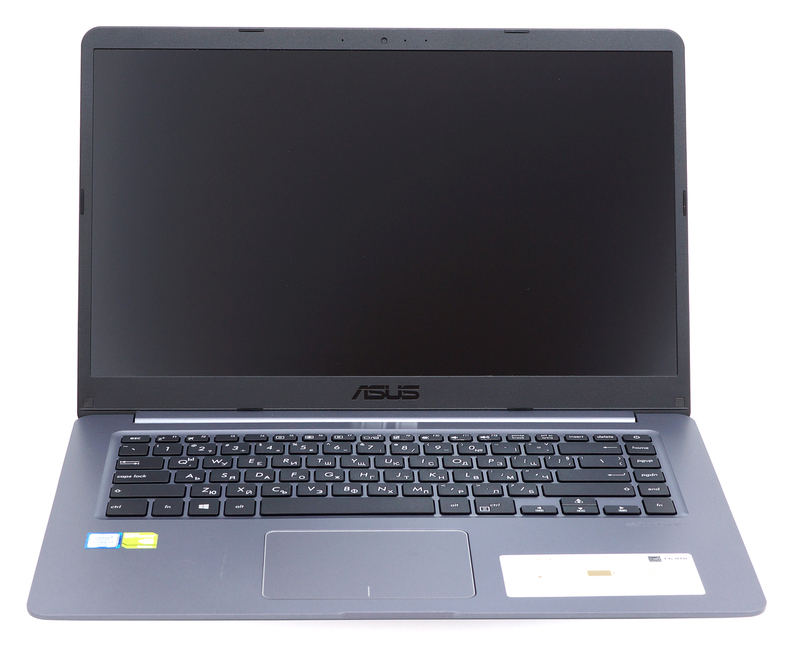 ASUS recently released a number of new notebooks in the low to mid-range segment of the market almost all of which, however, impress with good value for the asking price. In this review, we will take a look at the ASUS VivoBook 15 – a what seems to be a well-balanced mid-range notebook with plenty of power to run some of the modern games in low settings while delivering pretty good multimedia experience thanks to the IPS panel and decent sound quality. 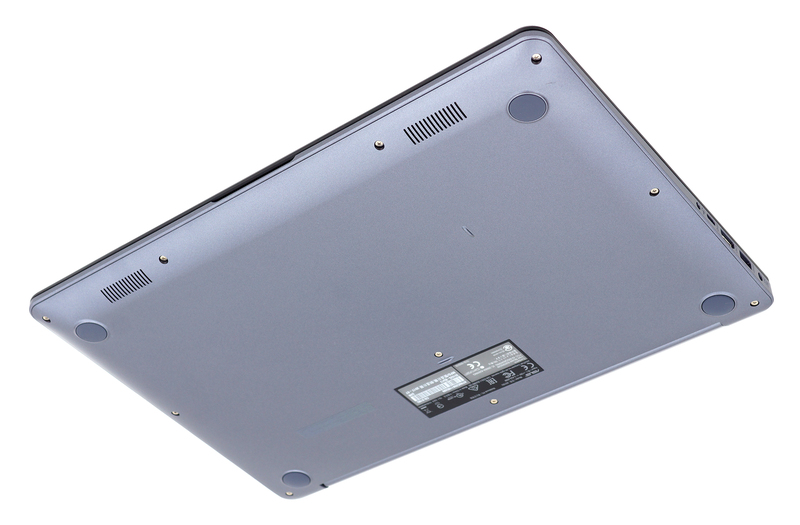 In addition, the VivoBook 15 impresses with fairly light and thin chassis without missing too much on the I/O. While all of this seems great, be aware that some of the configurations sport TN panels and not IPS while the LED-backlit keyboard is optional. In any case, for around $800 you get an energy-efficient Core i7-7500U CPU, fairly powerful discrete GeForce 940MX GPU with 2GB of DDR3 – enough for light gaming and multimedia – and an M.2 PCIe NVMe-enabled SSD slot in addition to the standard 2.5-inch HDD bay. In this configuration, the X510UQ aims to displace the ASUS X556UQ while upgrading the chassis and the display. 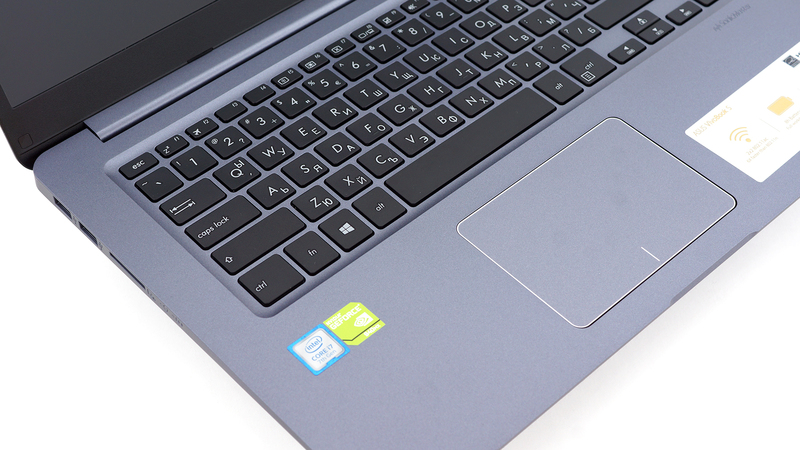 And compared to other similarly priced alternatives, the VivoBook 15 impresses with better value overall. Read the full review to find out the pitfalls of the notebook. 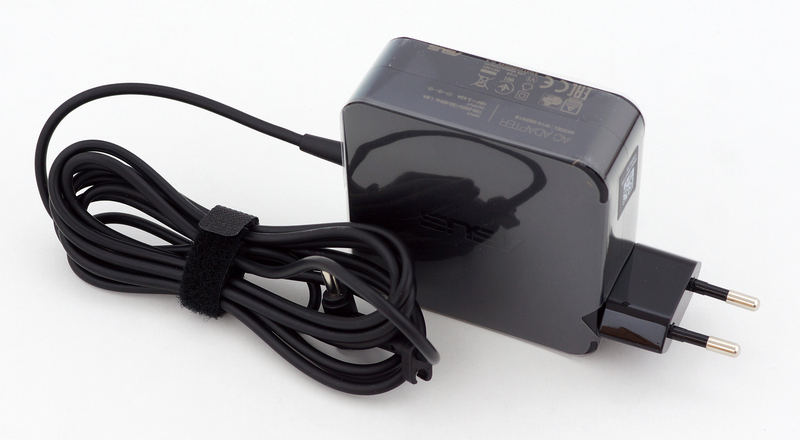 The laptop comes in a standard package containing all the usual user manuals, AC adapter and power cord. In terms of design, the laptop looks and feels like the old X556 series but manages to keep the weight around 1.65 kg and an approximate thickness of 17.9 mm – a noticeable improvement. In addition, the plastic used for this build feels a bit more robust and way better looking. The lid is the first thing that draws the similarity between the old X550-series and the X510 – it’s still made of plastic and features that iconic concentric circle pattern. Pressing the middle results in slight bending and barely noticeable ripples on the LCD screen. It’s also fairly resistant to torsion. Speaking of the screen, we are impressed by the thin side bezels and to be honest, the upper one and the bottom chin are pretty narrow as well. 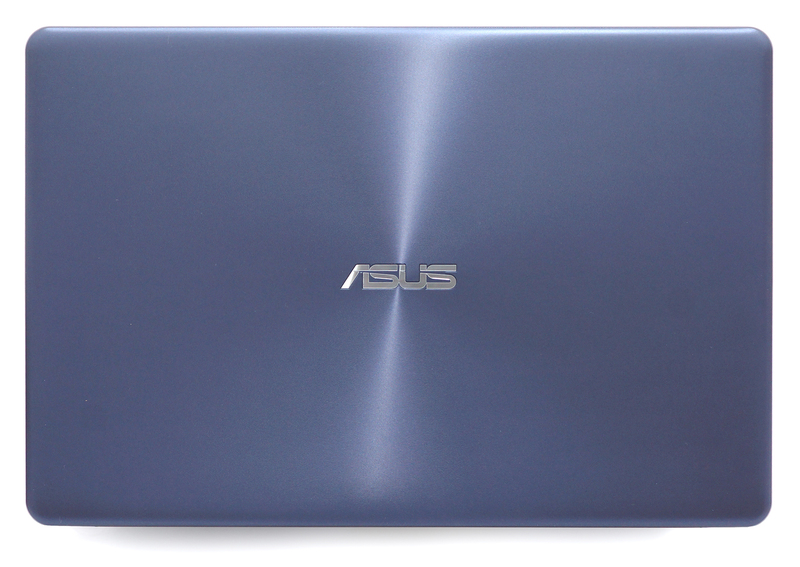 This distinctive feature, which ASUS markets in its website, really gives the laptop a more premium look. The single-hinge design feels reasonably stable but probably a bit overly-tightened at the beginning – you’d need both hands to open it up. The bottom is also made of plastic but this time it matches the color of the exterior and successfully imitates anodized metal finish. As we go around the sides, we find the usual set of I/O that is well-distributed. On the left, you can see two USB 2.0 connectors and an SD card while the right side holds the DC charging port, one USB 3.0, full-sized HDMI, 3.5 mm audio jack and one USB-C 3.1 (Gen 1) connector. Opening the machine reveals a familiar interior that feels somewhat cheap mostly due to the keycaps of the keyboard. They feel kind of roughened and the keys provide a bit shorter than usual travel but compensate with an adequate tactile feedback. Too bad the LED illumination is optional and isn’t a standard here. The material around the keyboard and the touchpad, though, is smooth, strongly imitates anodized aluminum and it’s rather stable. All areas, except the one right next to the center of the hinge, feel solid and don’t give in under pressure. And finally, as far as the touchpad goes, it’s definitely one of the best clickpad designs we’ve used in the price range. It has good gliding surface and works with light mouse clicks. Also, it doesn’t feel sluggish and gestures work pretty well. 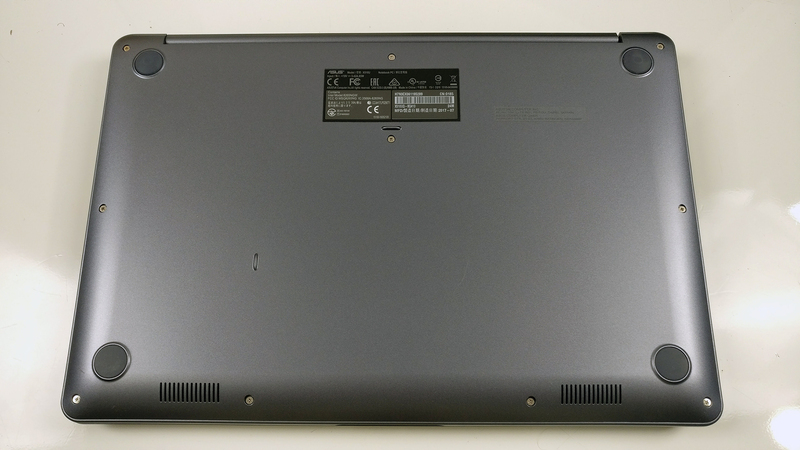 Overall, the ASUS VivoBook 15 X510 sports a well-built case with only a few drawbacks that are otherwise inherent to this segment of the market. Our criticism isn’t strong and should be taken as a recommendation for the next generation. You will be happy with the compact, light and fairly sturdy chassis providing all the usual I/O and comfortable enough input devices for some work on the go. The thin screen bezels and clean simplistic look of the machine are an added bonus. Since there are no service lids, you will have to remove the whole bottom plate, which is rather easy but a bit tricky. Make sure you’ve removed all the screws including the ones hiding under the rear silicone feet as shown in the photos below. Then start prying it up with a thin plastic tool from the rear grills – that’s where the plate comes off easily. 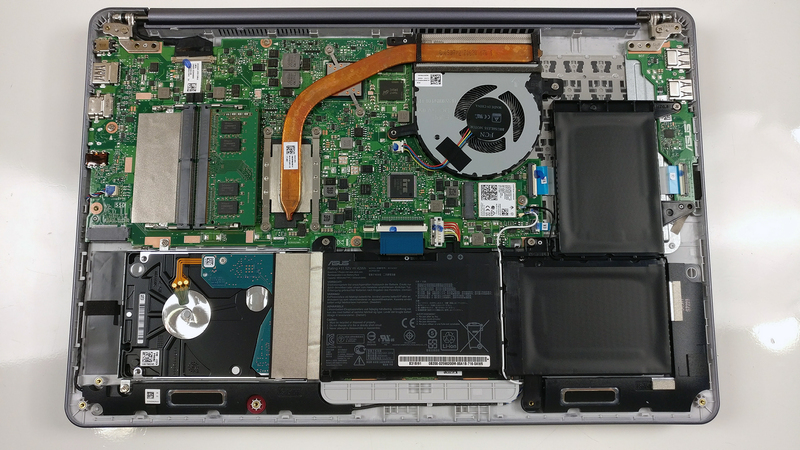 The laptop comes with the usual 2.5-inch HDD/SSD bay and an M.2 PCIe NVMe-enabled SSD slot but in our case, only the former was occupied by a standard 1TB HDD. 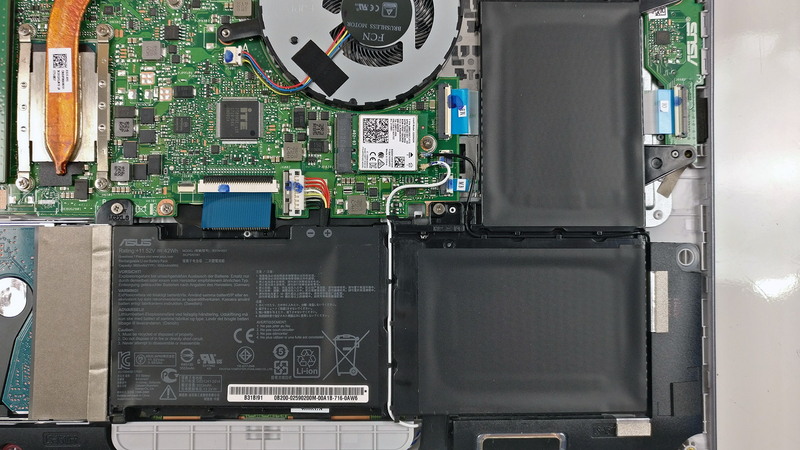 The M.2 slot is located right next to the hard drive. 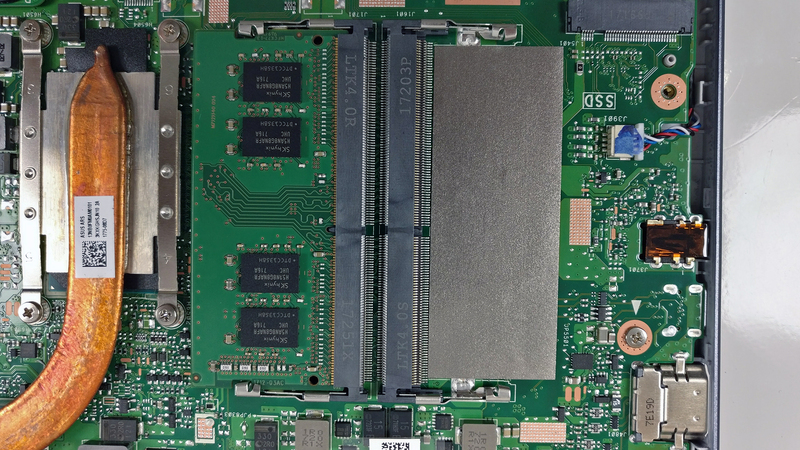 Good news about the RAM configurations – the motherboard holds two memory slots that can go up to 16GB of DDR4-2400 each. 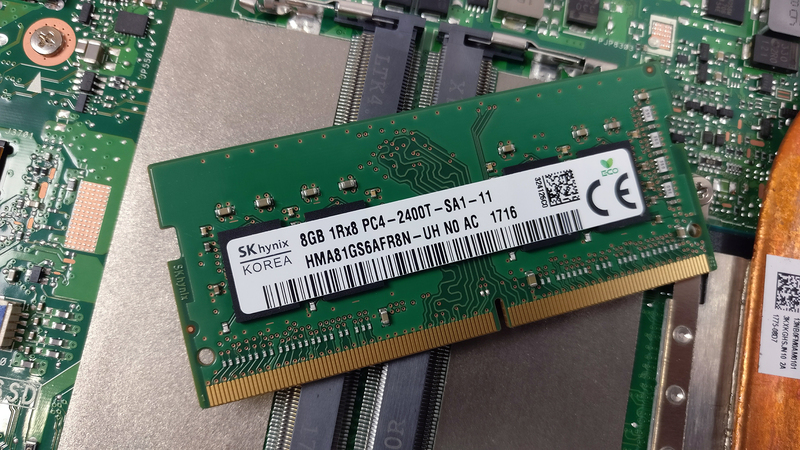 Our unit, however, featured just one 8GB DDR4-2400 SK Hynix stick. 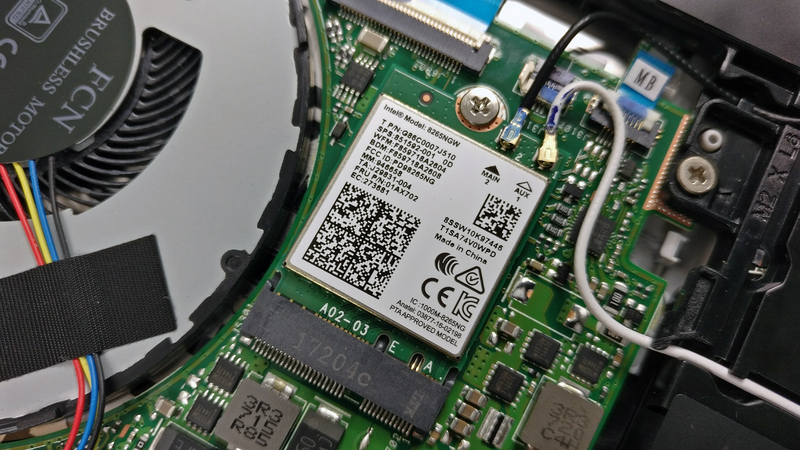 The Wi-Fi adapter can be found near the cooling fan and it’s Intel 8265NGW. The battery isn’t the biggest we’ve seen in such laptop (42Wh) so it’s only logical that the battery scores are just about average. The cooling system consists of just one big heat pipe going across both heat sinks – the CPU and GPU. So we weren’t surprised that the system sustains higher than normal temperatures at heavy workloads. 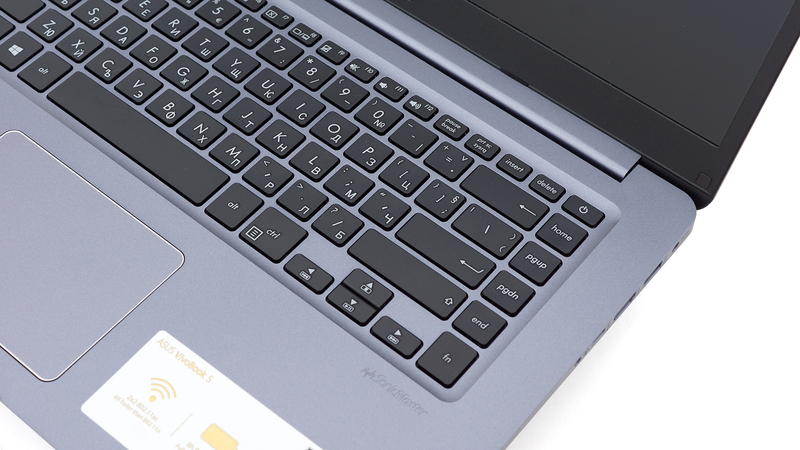 The laptop uses an LG-made IPS panel with Full HD (1920×1080) resolution with model number LP156WF9-SPK2. The pixel density is 142 ppi while the pixel pitch is 0.18 x 0.18 mm so it can be considered as “Retina” when viewed from a distance equal or greater than 60 cm. Viewing angles are good since it’s an IPS panel. The maximum brightness we were able to record is 255 cd/m2 in the center of the screen and 243 cd/m2 as average acorss the surface with 17% maximum deviation in the upper right corner. 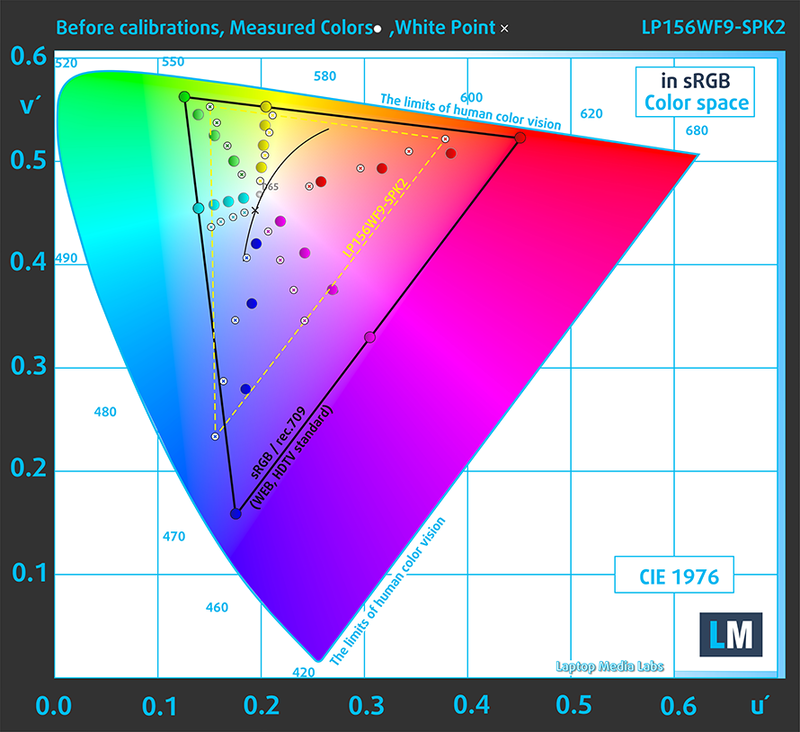 The color temperature on white screen at maximum luminance is 7800K – colder than usual so colors will appear slightly colder/blue-ish. As we go along the grayscale, the color temperature becomes closer to the optimal 6500K but still colder than it should be – 7480K. You can see how these values change at 140 cd/m2 (74%) brightness. 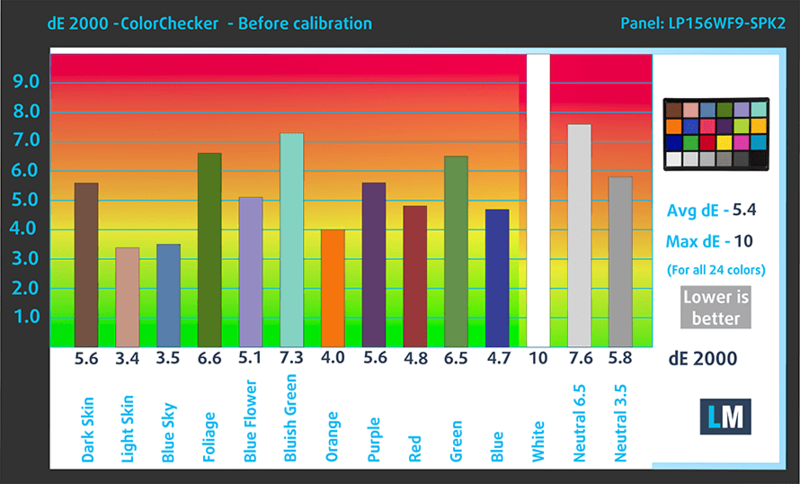 The maximum color deviation compared to the center of the screen is 4.4, which is a bit higher than the acceptable 4.0 value. This should be taken into consideration when color-sensitive work is involved. THe ocntrast ratio is pretty good – 1000:1. The sRGB color gamut according to our equipment is 55% so almost half of the colors on the web and on HDTV will be missing but that’s rather normal considering the price point of the laptop. 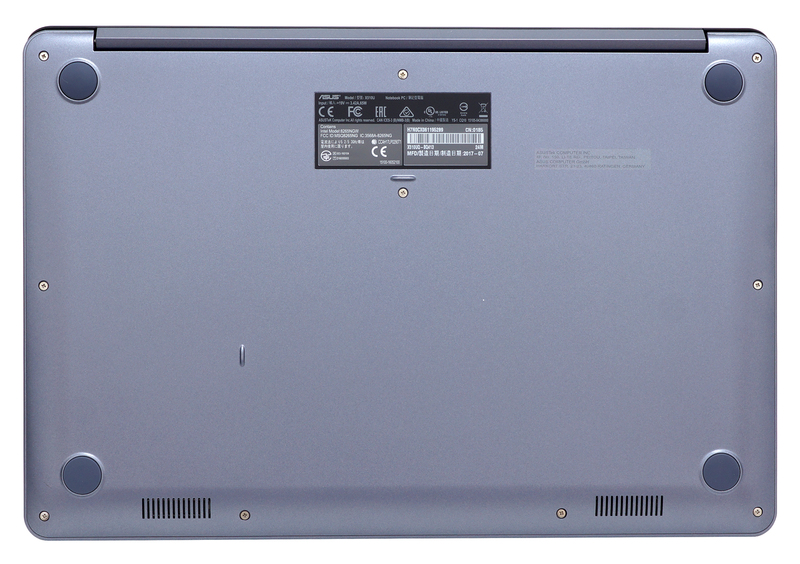 Fortunately, the panel doesn’t use PWM for regulating screen brightness so it’s safe to use in this regard for long periods of time. As expected, the VivoBook X510 is a budget-oriented multimedia machine so some sacrifices should be maed along the way. The good news is that the display quality is good although, the laptop uses a budget IPS panel, which is always a preferable choice overa a TN display anyway. Don’t get us wrong, though, the screen is fine – it’s bright enough to offer comfortable working experience indoors, it has high contrast ratio and doesn’t use PWM for regulating brightness. The only considerable drawback here is the limited sRGB coverage and if it’s of great importance to you, we suggest opting for a pricier solution altogether. The sound quality is overall fine in the low, mid and high frequencies with just small deviations. We used a fresh install of the Windows 10 Pro for the writing of this review so if you wish to do the same, we suggest downloading all of the needed drivers from ASUS’ official website. As to be expected, the notebook doesn’t impress with battery endurance due to the relatively low capacity of just 42Wh but still, it scored just about the average for the price range. All tets were performed using the same settings as always – Wi-Fi turned on, screen brightness set to 120 cd/m2 and Windows power saving feature turned on. Pretty average result here – 350 minutes (5 hours and 50 minutes). Almost identical score on the video playback test – 348 minutes (5 hours and 48 minute). Of course, the laptop isn’t made for gaming away from the power source but it’s good to know that it can handle heavy workload a little over two hours – 126 minutes (2 hours and 26 minutes). The Core i7-7500U is part of the latest Intel Kaby Lake generation of CPUs built upon 14nm manufacturing process – or 14nm+ as the company markets – and should offer marginal performance gains over the Skylake generation while improving overall power efficiency. It’s a direct successor to the Core i7-6500U (Skylake) and Core i7-5500 (Broadwell) but opposed to previous architecture refreshes, the Kaby Lake Core i7-7500U is bringing much higher clock rates. 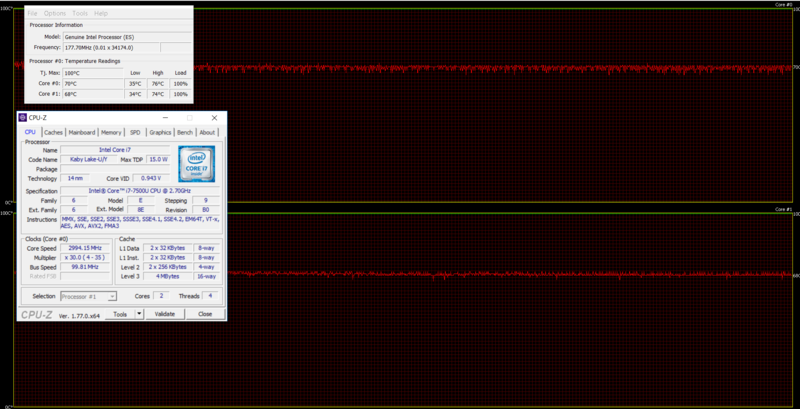 Now the chip is clocked at 2.7 – 3.5 GHz (compared to the 2.5 – 3.1 GHz on the Skylake Core i7-6500U) and still adopting the 2/4 core/thread count using the HyperThreading technology with a maximum 4MB cache. However, the Core i7-7500U’s TDP is still rated at 15W including the iGPU and dual-channel memory controller that supports DDR4-2133, LPDDR3-1866 and DDR3L-1600. And as far as the iGPU is concerned, it integrates a slightly improved Intel HD Graphics 620 clocked at 300 – 1050 MHz, which is slightly higher than the iGPU on the Core i5-7200U (300 – 1000 MHz). Here you can see an approximate comparison between the CPUs that can be found in the ASUS VivoBook F510 (X510) models on the market. 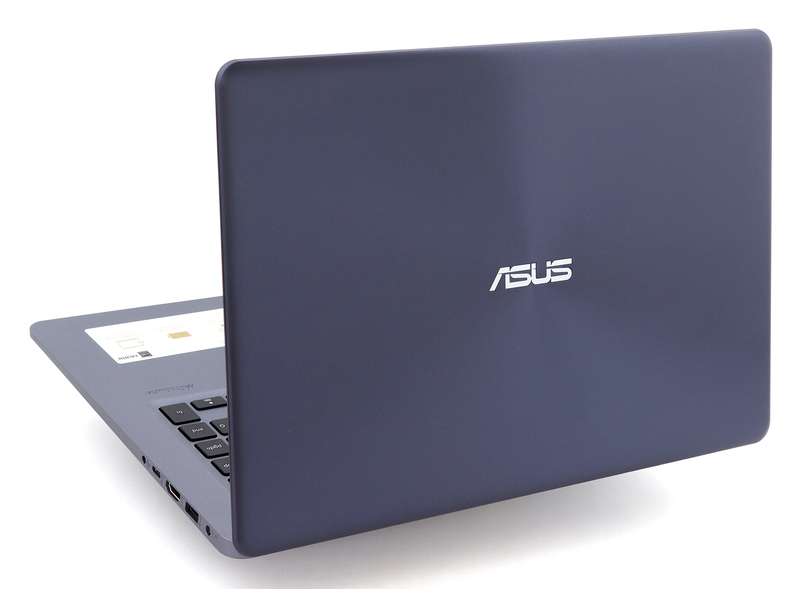 This way you can decide for yourself which ASUS VivoBook F510 (X510) model is the best bang for your buck. Fritz is a chess benchmark that tests the computing capabilities of the CPU with various chess moves. 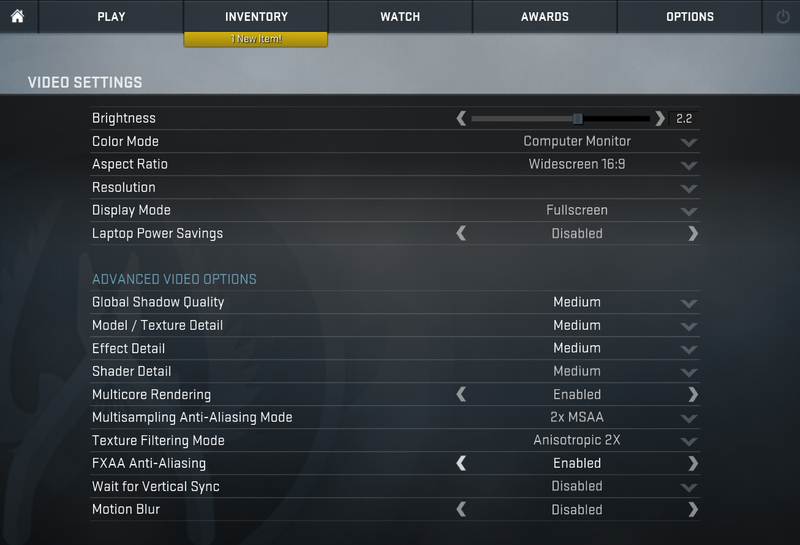 The Intel Core i7-7500U scored 6.850 million moves per second. In comparison, one of the most powerful chess computers, Deep(er) Blue, was able to squeeze out 200 million moves per second. In 1997 Deep(er) Blue even beat the famous Garry Kasparov with 3.5 to 2.5. Here you can see an approximate comparison between the GPUs that can be found in the ASUS VivoBook F510 (X510) models on the market. 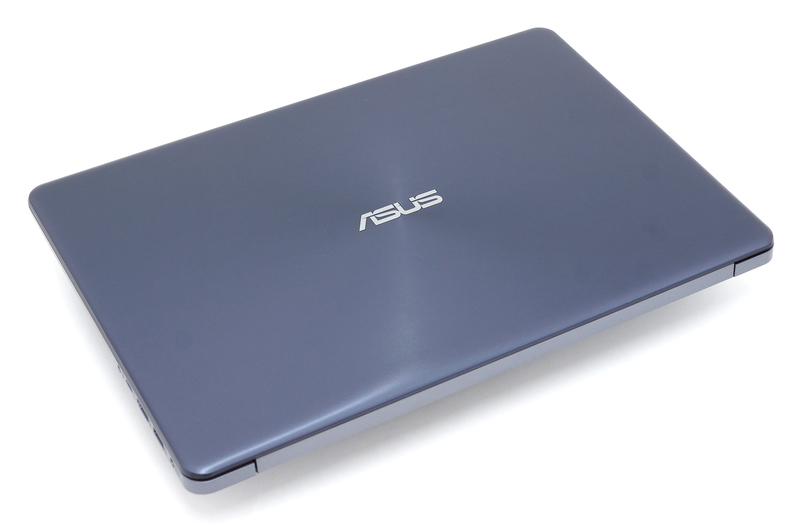 This way you can decide for yourself which ASUS VivoBook F510 (X510) model is the best bang for your buck. 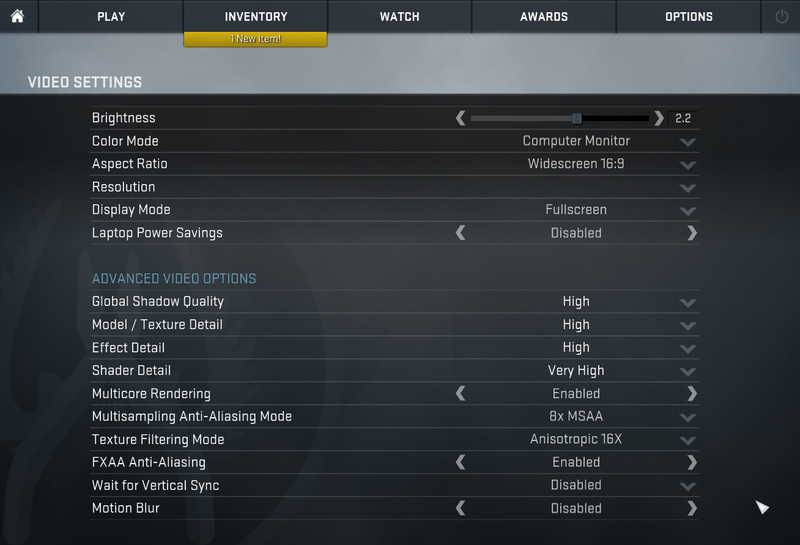 Of course, the stress tests can’t be taken as a representation of real-life scenarios because even gaming can’t put so much stress on the CPU and GPU all at once for long periods of time but remain as the most reliable way to assess the overall effectiveness and stability of the cooling system in the long run. We started off with 100% CPU load for about an hour. The Core i7-7500U utilized its Turbo Boost frequency for a short period of time before settling between 3.0 and 3.1 GHz, which is still within the Turbo Boost range. 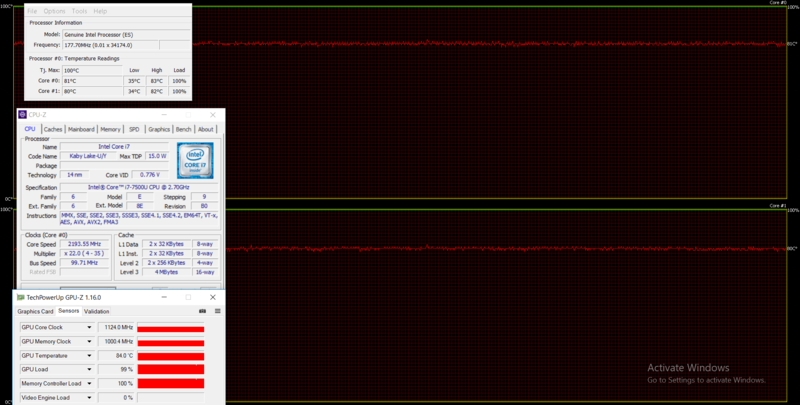 Switching on the GPU stress test resulted in CPU throttling but the GeForce 940MX sustained its base operating frequency although, running way too hot – 84 °C. 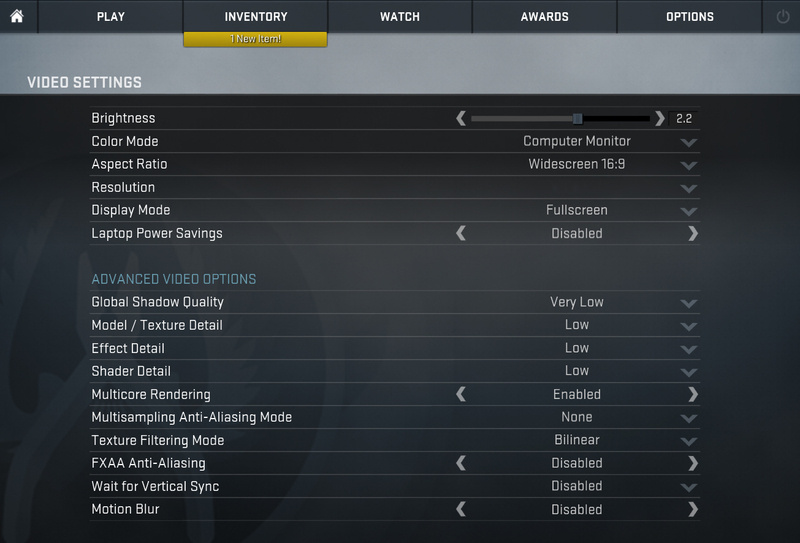 Even high-performance gaming notebooks don’t reach such high GPU temperatures. Fortunately, though, the inner temperatures didn’t result in overheating around the interior as you can see from the heat map below. The ASUS VivoBook 15 (X510) seems like a decent all-rounder for the asking price but there are some considerable drawbacks that need to be considered and, of course, the alternatives on the market. 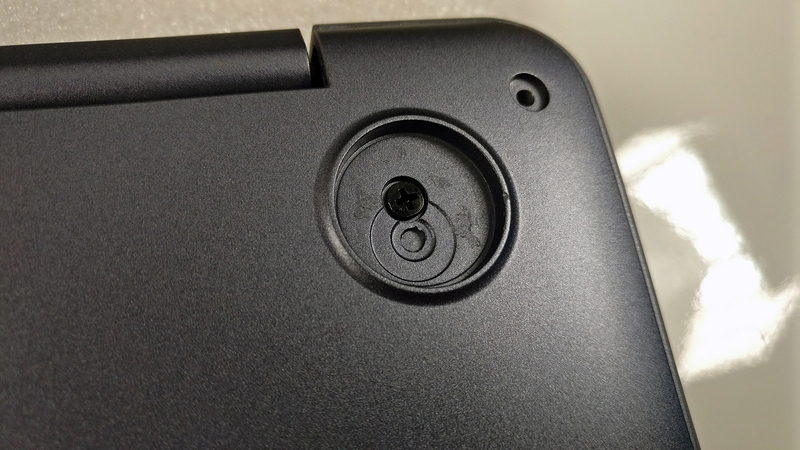 The build quality is good despite the all-plastic exterior and interior, which in return reduces the overall weight of the device significantly. 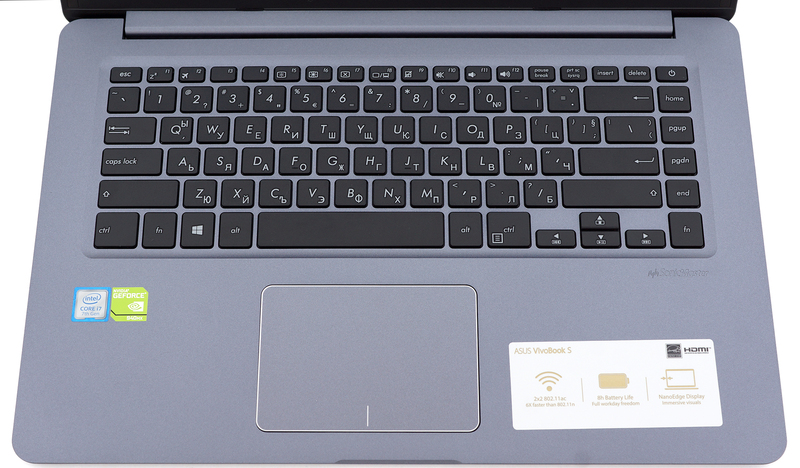 The VivoBook 15 (X510) impresses with portable dimensions – mainly thanks to the thin side bezels of the screen – and relatively low weight for a 15-inch device. The port selection isn’t limited as well and we find the input devices fairly comfortable to use on the go. The missing LED illumination is a letdown, though. The display quality is overall nice and we really like that ASUS went for the budget IPS option rather than sticking to the TN alternatives that are usually inherent to laptops in this ballpark. The absence of PWM and the high contrast ratio are a big plus but the limited sRGB coverage might not suit everyone’s needs. When it comes to performance, though, the hardware is fully capable of handling the usual office work, general browsing, multimedia and conditional light gaming. We do have to note, however, that the cooling system sustains higher than normal temperatures under stressful loads – gaming included. Nonetheless, the price tag of the configuration with the 940MX poses a serious question whether or not it’s worth your hard-earned cash. 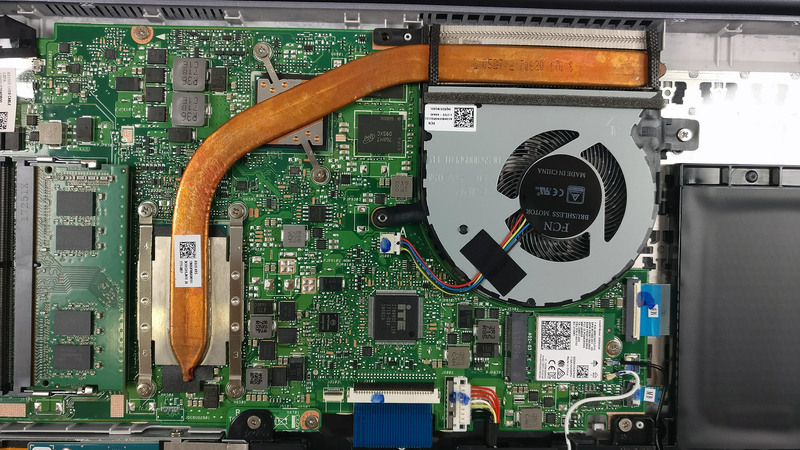 The price difference between the ASUS VivoBook Pro 15 N580VD with the Core i5-7300HQ processor and the VivoBook X510 that we reviewed is negligible while the former has aluminum build, considerably more powerful hardware, more reliable cooling system and much better screen quality. 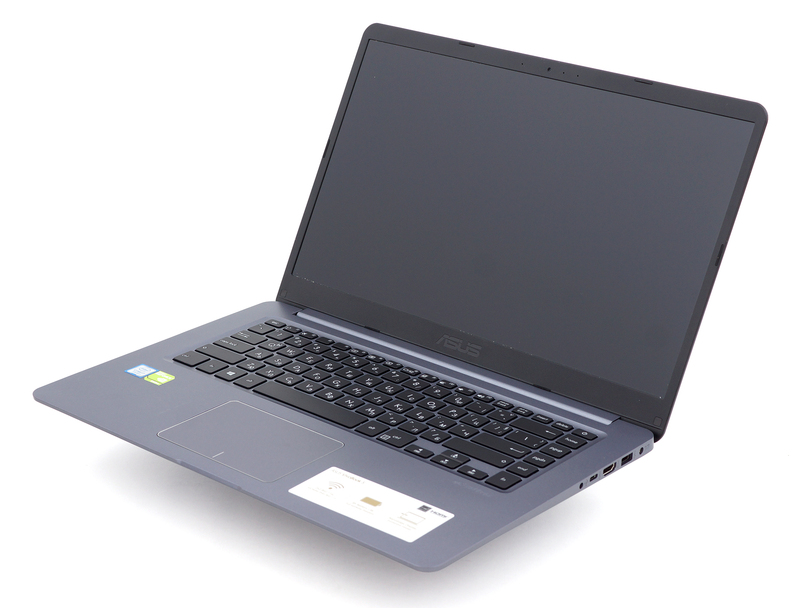 Other 15-inch alternatives with similar hardware and displays are the Dell Inspiron 15 5567 (configurations with IPS), the more business-oriented Lenovo ThinkPad E570 and the Lenovo Ideapad 520 as a direct competitor. Good review. The S510UN is on sale here in the US with the 8550U and an MX150. Do you know how much of the hardware, like NVMe, the panel, etc, carried over to that model? The NVMe standard – definitely but for the rest of the specs, we can’t confirm until we test it out. I have seen the M.2 slot in this model is SATA standard instead of NVMe. In some Asus configs, the SSDs they have included are also SATA. I hope you would have a chance to try pluging in an NVMe stick and see whether it works. 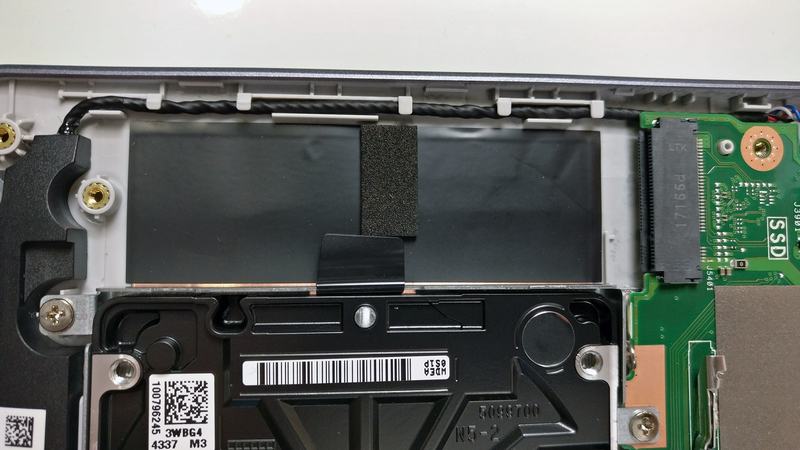 I have also watched other web sites where they say there is a SATA slot. I bought a NVMe Samsung and I think it won’t work. Can someone else confirm this info? Is there another way to buy the display profile? ASUS laptops are great. Shame this one doesn’t have a numpad though. But I guess they’ve gotta leave it off so they can make the entire thing more compact. Excellent. Good analysis for smart buying. I am impressed.